The American beaver (Castor canadensis) has made its first appearance at the VIC in at least two years! Signs of beaver across the property have hinted at the presence of this large rodent such as fresh chews, slides, and successional beaver ponds. Their elusive behavior has managed to keep them hidden until a recent encounter with one of our visitors. August 1st, 2018 will mark the 100 year anniversary of hikers beginning their adventure to climb all 46 High Peaks in the Adirondack Park. Herbert K. Clark was the first to accomplish this, approximately seven years after he started. Since then, people from all over the world have visited the Adirondack Park and followed in Clark’s footsteps, accomplishing an incredible feat. Today, there are just under 11 THOUSAND confirmed 46ers! Due to low precipitation and humidity, the New York State Department of Environmental Conservation (DEC) fire risk has jumped from low to moderate across the state. According to the DEC, 45% of wildfires in the Adirondacks are caused by campfires. This makes campfires the leading cause of wildfires in the park, with lightning being the second highest cause. To mitigate the risk of starting a wildfire, you should avoid the burning of brush during moderate fire risk. Just yesterday (at the time of recording this episode) a wildfire was started in Onchiota. The fire burned for several hours, and 5 fire departments from the surrounding areas responded. At the time we recorded this episode, the cause of the fire was still unknown. According to the Adirondack Daily Enterprise, the fire was started due to a downed power line. Check out their articles on the burn for more information. Thanks for tuning in to our first episode of Adirondack Naturalist: Explorations in Natural History! As you could probably tell, we could have gone on and on about bats and moths, their threats, importance, and unique predator-prey relationship. If you want to learn more about either of these incredible groups, come chat with us at the Paul Smith’s College VIC or ask us questions in the comments! There are 9 species of bat found in the Adirondacks, but little brown bats (Myotis lucifugus) are the most common. They are the smallest bat in the state, and feed primarily on mayflies, mosquitoes, and midges. 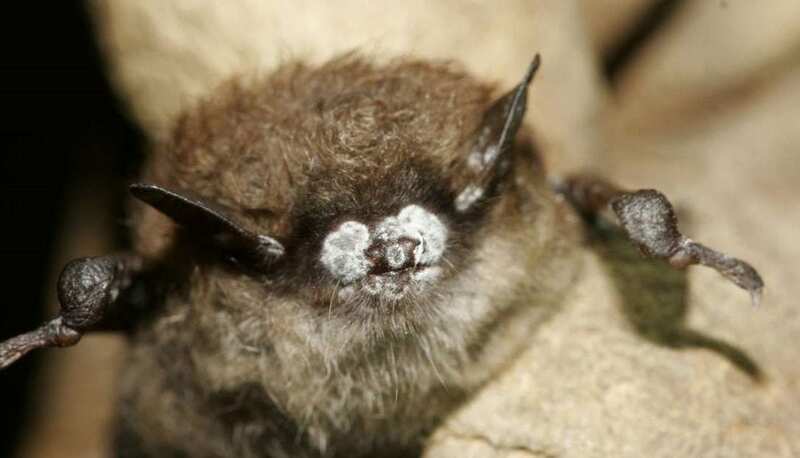 The IUCN Red List of Threatened Species currently lists little brown bats as Least Concern; however, this species has not been assessed since 2008, shortly after the discovery of white-nose syndrome. These adorable little guys can be found foraging for insects above waterways, and you’ve probably seen them flying around your yard at night as well! A single colony of little brown bats can consume around 900,000 insects per night. Imagine if there were that many more mosquitos and flies bothering you on your hikes in the blue line! Moths have a tapetum lucidum to help them see at night! One of our naturalists managed to get a photo of this moth during our Moths by Nightlight program on July 21. Notice how the eye of the moth looks red, or displays an ‘eye shine’. If you want a chance to see this phenomenon for yourself, join us for the next program on July 29! Tapetum lucidums are common in nocturnal mammals, but only some species of frugivorous bats have one. Moths are incredible creatures; the order Lepidoptera contains about 160,000 unique species, of which over 90% are considered moths. They are extremely important as pollinators, as a food source for many different animals (including bats), as indicator species for environmental pollution/change, and as a source of information and material to study. Unfortunately, problems such as pollution, climate change, crop monoculture, pesticide use, and habitat loss have resulted in a large decline in the moth population. This is happening to almost all insect species, too, not only moths. Because moths are such an integral part of our ecosystems, this can have far-reaching effects. 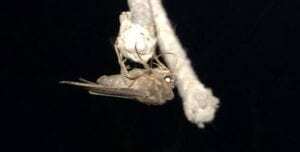 Adaptations in their adult form can help moths to avoid bat predation. This includes “ears” to sense bat echolocation, erratic flight patterns such as dropping out of the sky or quickly turning (before the echolocation even gets back to the bat—talk about fast reaction time! 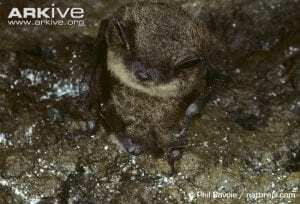 ), and even making noises similar to echolocation that can startle the bat, confuse it, or scramble the signal. Check out some of these species of moth common in the Adirondacks! After doing the math, we’ve come to the conclusion that despite bats evolving for considerable less time, moths still have them beat with number of species. For those of you interested, we calculated that bats have evolved at an average rate of 0.000019 species per year, and moths evolved at an average rate of 0.0008 species per year. That would mean that a bat species evolves once every 53,000 years, and a moth species evolves once every 1,250 years. Of course, these are just averages, and the math was done from approximate numbers (the numbers of moths could vary by the thousands, and the first appearance of bats is not known). Still, even with the variability and possible sources of error, it is clear that the moths win this round! Bats have moths beat in other areas, such as their contribution to agriculture and pest control. Don’t forget to leave us a comment and let us know which team you’re on! As promised, the link to Dr. Curt Stager’s op ed on declining insect populations and the need for more field researchers! Get involved with Professor Janet Mihuc’s citizen science monitoring project. What could you tell me about Wolf spiders, and how to rid our property of them? Our daughter had one on her door and knocked it off, only to watch in horror as it went into the house. It then threatened her small kitty, lunging for it. My daughter grabbed the small cat, and tossed it on to a futon, out of harms way. She didn’t know what to do next, and tossed a newspaper on it, and proceeded to step on it. She is the type of person who sweeps up ants and spiders and puts them back outside where they belong! But her baby kitten had just gotten over an illness and the little guy didn’t need anymore tragedy in its life. Hey Don, thanks for the comment! Wolf spiders may look scary, but they are actually pretty harmless to people. Despite this, if you are still interested in minimizing wolf spider numbers on your property, here’s what we recommend: 1) Remove excess vegetation and yard debris from around your house. Wolf spiders like living in tall dense grasses, around plants/shrubs, and under rocks/wood piles. However, excess vegetation and yard debris can make great habitats for lots of other wildlife as well. Please weigh your pros and cons before making these changes! 2) Minimize outdoor lighting. This can attract various insects that wolf spiders like to eat, and will therefore attract more wolf spiders. 3) Double check to make sure that any cracks or holes in and around your home are sealed. This is good for keeping lots of pests out, not just wolf spiders!